Universal health coverage (UHC) has been recognized as the most important immediate goal for global health. Attempting to achieve this goal for the country, the Government of India, has been taking measured steps, trying to ensure equitable access to high-quality affordable health-care services for all citizens. 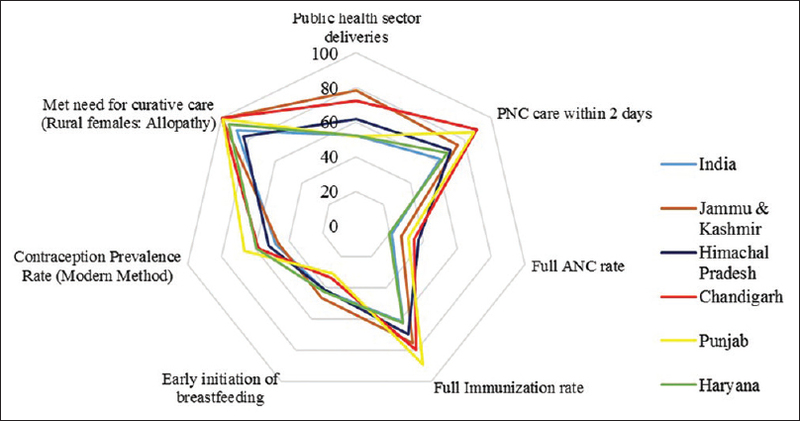 This article attempts to identify the success of these efforts through a baseline situation assessment of UHC dimensions in India, followed by a critical analysis of what is being done to fulfill the gaps, and finally propose a health policy roadmap for UHC with implications at national and state level. Literature review presents a varied scenario with respect to the coverage of key services essential for service packages, reflecting need for significant improvement. Large-scale inequities in health-care service delivery and health indicators have been observed, with poor financial risk protection of the community from catastrophic spending on health care. Various reasons for this were identified, such as low public investment in health services, poor health-care service delivery system, poor quality of services offered to the community, and lack of robust financial protection mechanisms. The study proposes a contextual restructuring of the health system, initiating with an increase in financial investments in public health-care sector. This should be supplemented with health system strengthening by improving overall service availability for the community with optimal quality and at low cost. Private sector service provisioning should be regulated by developing and implementing strong accountability measures. The governance capacity of public sector should be augmented to improve success rates of the demand-side financing schemes. Health technology assessments should become the mainstay of taking decisions on benefit package. A holistic multipronged approach constituting all these changes is required if health coverage has to be made universal in the country. 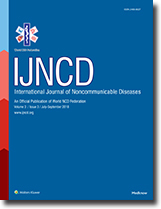 Background: Noncommunicable diseases are increasing in proportion in developing countries. Ovarian cancer has the highest case fatality rate among gynecological cancers but forms only 3%. Its etiology is unknown, and no cost-effective screening program exists due to the absence of well-defined precursor lesions. Early symptoms are vague but can be used to detect Stages I and II diseases. Documented knowledge or awareness of ovarian cancer varies between 4.4% and 15%. However, this is the first community-based survey in Africa to determine knowledge of ovarian cancer by females. Materials and Methods: The questionnaire was semi-structured and interviewer administered. Females aged 15 years and above were selected through a four-stage process involving urban/semi-urban settings, local government areas, wards, and units. We randomly selected 424 participants, equally distributed between urban and semi-urban areas. Bivariate and linear regression analyses were done. Results: Most (83.5%) of the respondents were <40 years, married (56.1%), had secondary education (52.4%), Yoruba (92.5%), and Christian (56.1%). With good knowledge score taken as having at least 70% of required information, about 2.8% of respondents had good knowledge of ovarian cancer. Only level of education and occupation significantly affected knowledge of ovarian cancer. Conclusion: There is very poor knowledge about ovarian cancer, its risk factors, symptoms, treatment, and prognosis among females in Ibadan, strongly affected by education and occupation. Background: Children born as small for gestational age (SGA) tend to develop central adiposity and may have chances of developing metabolic syndrome. Waist–hip circumference ratio (WHR) is considered as a good indicator of central/truncal obesity. The complete absence of information on growth dynamics of WHR among Indian symmetric and asymmetric SGA infants has prompted us to undertake this study. Aim: The aim was to study the pattern of growth of waist circumference, hip circumference, and WHR of symmetric and asymmetric SGA infants. 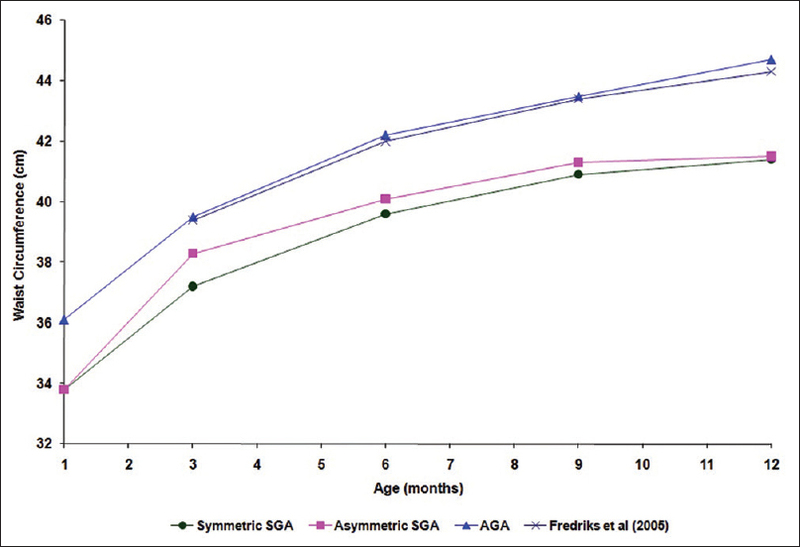 Materials and Methods: Waist and hip circumference of full-term 100 symmetric SGA, 100 asymmetric SGA, and 100 appropriate for gestational age (AGA) infants was measured at 1, 3, 6, 9, and 12 months in Growth Laboratory/Clinic of the Department. Student's unpaired t-test was used to assess intragroup (symmetric vs. asymmetric), intergroup (SGA vs. AGA), and gender differences. Results: A consistent increase in the mean waist and hip circumference was noticed among symmetric and asymmetric SGA and AGA infants of two sexes. Male infants of both SGA groups possessed similar waist and hip circumference at 1 month. Whereafter, asymmetric SGA males had a larger waist and lesser hip circumference than symmetric infants. Asymmetric SGA females possessed larger waist circumference throughout infancy, while hip circumference measured larger only till 3 months as compared to symmetric females. Conclusion: SGA infants of two types and gender exhibited compromised auxological attainments for waist and hip circumference compared to normal babies. Higher WHR recorded in asymmetric SGA than symmetric SGA and AGA babies appear to suggest that asymmetric infants may have greater tendency to develop central obesity, subsequently. Background: Among noncommunicable diseases, hypertension is one of the most important risk factors, the control of which imposes a huge financial burden on the healthcare system and the society. Objectives: The objective of this study was to measure the monthly cost incurred in care of hypertension in urban Puducherry and to estimate the total annual cost required to provide care for the adults with hypertension in a typical primary health center (PHC) of India. Materials and Methods: The study was conducted in the service area of urban health center (UHC) in Puducherry, functioning under the Department of Preventive and Social Medicine, JIPMER. A sample of 238 adults ≥ 18 years identified through a baseline survey conducted in 2014 was interviewed using a pretested semi-structured questionnaire. The questionnaire collected information on sociodemographic data, place of seeking hypertension care, and its duration and various direct and indirect costs incurred. Recall period was fixed as 1 month for OP care and 1 year for hospitalization. A prevalence-based approach was used for calculating the cost of illness. Average monthly and annual direct and indirect costs were calculated and were compared across the type of facility of care and with the presence or absence of comorbidities. The cost of care from UHC and other government hospitals were calculated from standard rates. The average annual cost from UHC was used to calculate the annual amount required to provide care of hypertension in a typical PHC of India. Results: Among the 238 participants, 73.5% (n = 175) were female, and the mean (standard deviation) age was 58 (11.7) years. Majority (72%, n = 172) took care for their hypertension from UHC, JIPMER. Half of them (n = 119) had associated comorbidities. Average monthly direct cost of care for hypertension was 223.2 (198.0–329.4) Indian national rupees. There was statistically significant difference in the cost of care among participants utilizing public and private facilities, and also among participants with comorbidities and without comorbidities. The estimation of annual cost of hypertension care for a typical PHC comes around 1.07 crores. Conclusion: The control of hypertension in a community leads to a significant load on health system; however, it is essential for preventing further catastrophic costs as a result of complications and mortality. This cost could be saved if we could prevent the population from becoming hypertensives by preventive measures, and it will further lead to reduction in mortality and morbidity and the associated costs. Background: Secondary prevention strategies, including structured cardiac rehabilitation (CR), following myocardial infarction (MI) and coronary interventions may reduce the burden of mortality and recurrent morbidity. Objective: The objective of the study is to examine the effect of an adapted model of CR in patients who had experienced MI and had undergone percutaneous coronary intervention (PCI) in an Indian tertiary care hospital setting. Materials and Methods: A quasi-experimental design using control group and pre-test was used with patients post-MI and PCI. Fifty patients were allocated to CR intervention group for 12 weeks of intervention care compared with 51 patients in standard routine care control group. Results: After the 12-week program, participants in intervention group revealed a significant increase in coronary artery disease-related knowledge (P < 0.001), 6-minute walk test distance (P < 0.001), and high-density lipoprotein (P < 0.05). The level of physical activity was significantly higher in the intervention group in terms of mean duration of moderate or vigorous physical activity (P < 0.05) as well as mean of 10-minutes' continuous physical activity time at or above a moderate level (P < 0.01). Furthermore, depression levels (P < 0.05) and levels of glycated hemoglobin A1c significantly decreased (P < 0.05) in the intervention group. There were no changes observed in these parameters in the control group. Conclusion: CR is feasible and effective as it potentially improved health in patients who have experienced MI and had undergone PCI at a tertiary care hospital. Barriers may be recognized which might hinder participation in CR in Indian settings.